See our most recent publication in The Neuroscientist. See our 2018 publication in the European Journal of Anatomy. Click here to download the PDF. Geoghegan, K., Payne, D., Myers, M., Hall, S., Elmansouri, A., Parton, W., Harrison, C., Stephens, J., Parker, R., Rae, S., Merzougui, W., Nagy, E., Venkatesh, P., Parrott, R. and Border, S. (2018). The National Undergraduate Neuroanatomy Competition: Lessons Learned from Partnering with Students to Innovate Undergraduate Neuroanatomy Education. The Neuroscientist, p.107385841878800. Myers, M., Hall, Samuel., Stephens, J., Lowry, A., Seaby, E., Parton, W., McElligott, S,. Elmansouri, A., Harrison, C., Parrott, R., Border, S. (2018). 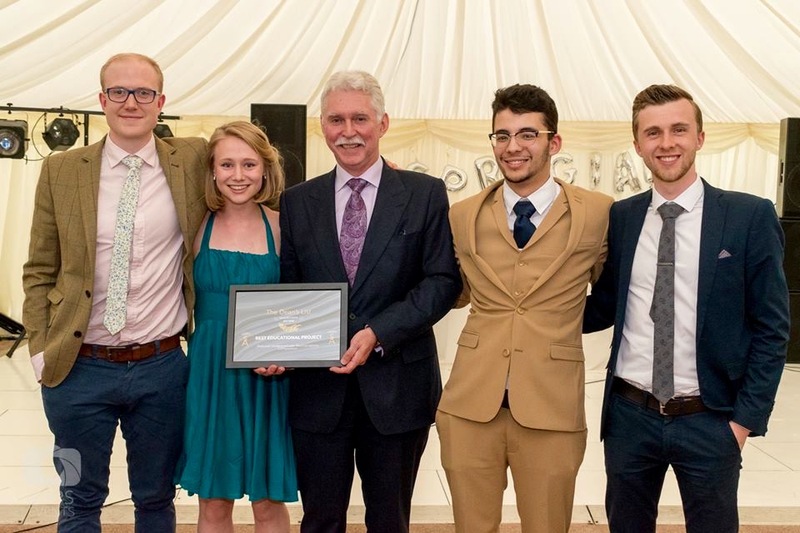 The National Undergraduate Neuroanatomy Competition: Five years of educating, inspiring and motivating our future neurologists and neurosurgeons. European Journal of Anatomy. Border, S. (2017). Working with students as partners in anatomy education. Anatomical sciences education, 10(6), 613-614. Border, S., Parton, W., Myers, M., Elmansouri, A., Harrison, C., Stephens, J., ... & Hall, S. (2017). Ten considerations for implementing effective and sustainable near-peer teaching in clinical anatomy education. MedEdPublish, 6. Harrison. C., Parton, J. C., Seaby, E., Ahn, K., Hall, S. R., Stephens, J., Border, S. (2016) Addressing Neurophobia from within: The impact of near peer teaching in an undergraduate Medical Curriculum. 11th Wessex National Medical Education Conference. Stephens, R. J., Hall, S., Andrade G. M., Border. S (2016) Investigating the effect of distance between the teacher and learner on the student perception of a neuroanatomical near-peer teaching programme. Surg Radiol Anat (published online ahead of print 25th May 2016). Hall. R., S. Stephens, R. J., Seaby. G. E., Andrade G. M., Lowry. A., Parton, J. C. W., Smith, F. C., Border. S. (2016) Can medical students accurately predict their learning? A study comparing perceived and actual performance in Neuroanatomy. Anatomical Sciences Education (published online ahead of print May 2016). Tayler, N., Hall, S., Carr, N., Stephens, J., Border. S. (2015) Near peer teaching in medical curricula: integrating student teachers in pathology tutorials. Med Educ Online 20:27921. Andrade, G., Stephens, J., Hall, S., Border. S. (2015) Distance along the near-peer teaching spectrum and its impact on the learner's experience. Anatomical Society Summer Meeting, University of Bradford UK. Journal of Anatomy 226, 189-213. doi: 10.1111/joa.12271. Lowry, A., Hall, S., Stephens, J., Andrade, T., Seaby, E., Parton, W., Dando, A., Scrimgeour, G., Border, S. (2015) The National Undergraduate Neuroanatomy Competition: a comparison of student performance over two years. Anatomical Society Summer Meeting, University of Bradford UK. Journal of Anatomy 226, 189-213. doi: 10.1111/joa.12271. Stephens, J., Border. S., Holmes, S., Kanzaria. A., Evans. B. T. (2015) What can fracture patterns tell us about the skull's protective capabilities of the brain? Anatomical Society Summer Meeting, University of Bradford UK. Journal of Anatomy 226, 189-213. doi: 10.1111/joa.12271. Hall, S., Stephens, J., Andrade, T., Seaby, E., Parton, W., Border, S. (2015) Evaluating the perceptions of medical students towards the difficulty of topics in the anatomy curriculum. Anatomical Society Summer meeting, University of Bradford UK. Journal of Anatomy 226, 189-213. doi: 10.1111/joa.12271. Seaby, E., Docherty, J., Andrade, T., Hall, S., Stephens, J., Lowry, A., Parton, W., Davey, H., Woods-Townsend, K., Border, S. (2015). Inspiring the Next Generation of Doctors: A project to engage Secondary School Children in Medicine through Clinical Anatomy. Anatomical Society Winter Meeting University of Birmingham. Ahn, K., Parton, W., Hall, S., Stephens, J., Gesteria-Andrade. M., Seaby, E., Lowry, A., Dando, A., Scrimgeour, G., Border, S. (2015) Developing the National Undergraduate Neuroanatomy Competition: advancing careers in neurology and neurosurgery. British Association of Clinical Anatomists, University of Bristol. Tayler, N., Hall, S., Carr, N., Stephens, J., Andrade, T. and Border. S. (2015) Near peer teaching in the medical curriculum: The successful integration of student teachers in pathology tutorials. British Association of Clinical Anatomists, University of Bristol. Hall, S. R., Stephens. J., Gesteria Andrade, M., Seaby. E., Tayler, N., Parton, W., Smith, C. F., Carr N. J., Border, S. (2015) Using Principal Component Analysis to Demonstrate Congruence Themes in Undergraduate Anatomy and Pathology Near-Peer Teaching. Anatomical Society Winter Meeting University of Birmingham. Smith, N., Seaby. E., Hall. S., Stephens, J., Davey. H., Woods-Townsend, K., Border. S. (2015) We don't mind doing it for the kids: Perspectives on learning anatomy from school children interested in becoming doctors. Anatomical Society Winter Meeting, Cambridge 14-16th December. Parton, W., Hall. S., Stephens. J., Seaby. E., Lowry, A., Harrison, C., Arofin, V., Border. S. (2015) Comparing attitudes and perceptions towards peer and near-peer teaching in neuroanatomy – a pilot study. Anatomical Society Winter Meeting, Cambridge 14-16th December. Pilborough, E., Patel. H., Seaby. E., Paterson. S., Lowry, A., Hall. S., Stephens. J., Border. S. (2015) Collaborative screen casting in anatomy: Assessing attitudes and perceptions of educational resources made in partnership with medical students. Anatomical Society Winter Meeting, Cambridge 14-16th December. Lowry. A., Seaby, E., Stephens, J. Hall, S., Border. 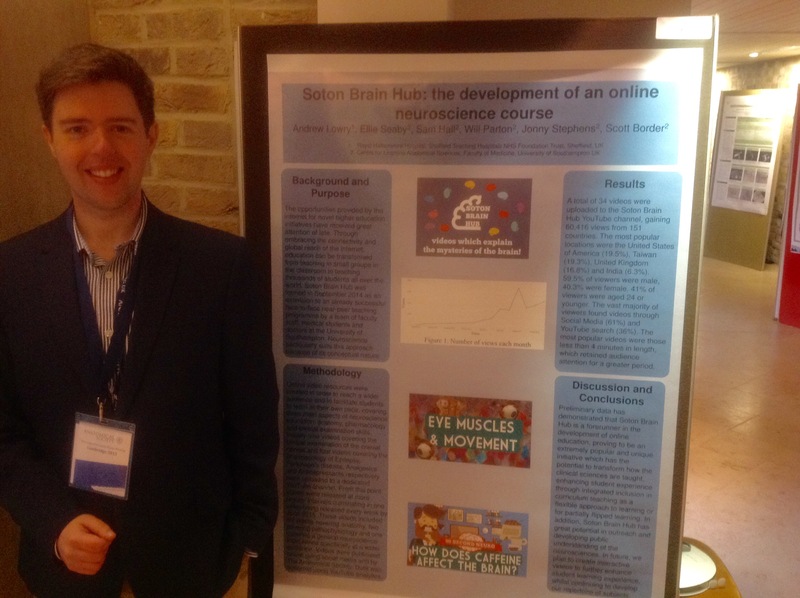 S (2015) Soton Brain Hub: The development of an online neuroscience course. Anatomical Society Winter Meeting, Cambridge 14-16th December. Seaby, E., Lowry, A., Hall, S., Stephens, J., Border. S. (2015) Collaboration between students and Teaching Fellows in Medicine at the University of Southampton. Enhancing Student Learning Through Innovative Scholarship Conference, Durham University 16th/17th July. Hall, S., Stephens, J. Andrade, M., Seaby, E., Lowry, A., Parton, W., Border. S. (2015). The National Undergraduate Neuroanatomy Competition: A success Story Of An Innovative Student/Faculty Partnership. Enhancing Student Learning Through Innovative Scholarship Conference, Durham University 16th/17th July. Parton, W., Seaby, E., Hall, S., Stephens, J. Andrade, M., Border. S. (2015) Developing a Sustainable Near Peer Teaching Program In Anatomical Sciences: A collaborative Exercise Between Staff And Students To Supplement Curriculum Teaching Sessions. Enhancing Student Learning Through Innovative Scholarship Conference, Durham University 16th/17th July. Hall. S., Stephens. J., Andrade. M., Davids, J., Lowry. A., Casselden. E., Emsley. E., Border. S. (2014) Launching the UK’s first National Undergraduate Neuroanatomy Competition: An innovative approach to support student professional development. European Journal of Anatomy 18 (4) 327-333. Tayler, N., Hall, S., Carr, N., Stephens, J., Andrade, T., Border, S. (2014) Do attitudes of students towards tutor type alter between year groups? 9th Wessex National Medical Education Conference. Education versus Training: Contrast or Compromise? Seaby, E., Hall, S., Stephens, J., Andrade, T., Parton, W., Border, S. (2014) Exploring the ability of medical students to self-assess exam performance and reasons influencing accuracy. Academy of medical educators (AoME) annual academic meeting. Royal College of Obstetricians and Gynaecologists, Regents Park, London. Wednesday 22nd October. Ahmad, U, Hall, S., Carr. N., J., Border. S. (2014) Student and teacher perceptions of the use of near peer teaching in neuroanatomy revision sessions. Journal of Anatomy 224, 739-759. Andrade, M. G., Stephens, J., Hall. S., Border. S. (2014). The lost art of dissection: letting a new generation of students see deeper inside the brain. Journal of Anatomy 224, 739-759. Stephens, J., Andrade, M.G., Hall, S., Border, S. (2014). Identifying important landmarks along the near-peer teaching spectrum within anatomical education. Journal of Anatomy 224, 739-759. Stephens, J., Hall, S., Andrade, M.G., Border, S. (2014). Can medical students accurately self-assess their own knowledge gain in a near-pear teaching setting? Association for the study of medical education (ASME) Annual Scientific Meeting, Brighton 16th-18th July. Hall, S., Andrade, M., Stephens, J., Davids, J., Lowry. A., Casselden. E., Emsley. E., Border. S. (2014). 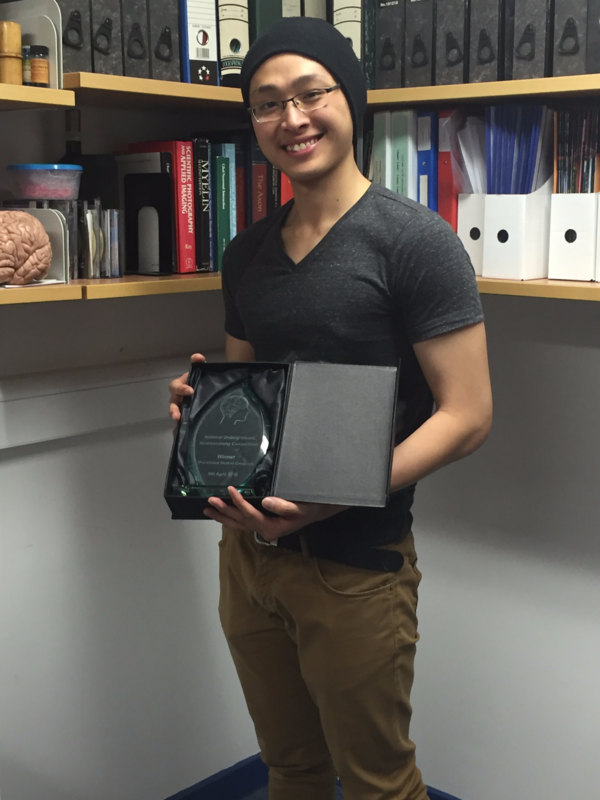 Meeting the demand: introducing an undergraduate neuroanatomy competition for medical students. Abstracts presented at the joint meeting of the British Association of Clinical Anatomists. Faculty of Medicine, University of Lisbon, Portugal. Journal of Clinical Anatomy 27: 929-943. Hall, S., Andrade, M., Stephens, J., Davids, J., Lowry. A., Casselden. E., Emsley. E., Border. S. (2014). Who are the best neuroanatomists? Results from the first national undergraduate competition. 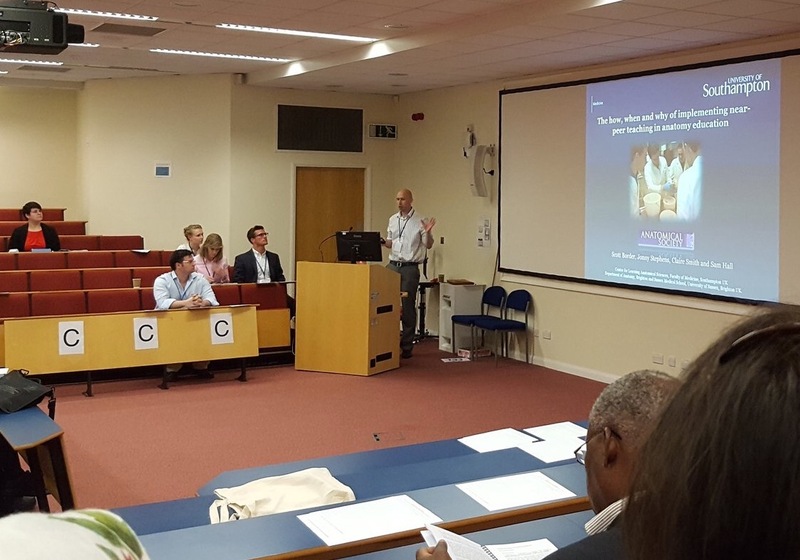 Abstracts presented at the joint meeting of the British Association of Clinical Anatomists. Faculty of Medicine, University of Lisbon, Portugal. Journal of Clinical anatomy 27:929-943. Hall, S., Stephens, J., Andrade, M., Davids, J., Powell, M. and Border. S. (2013) Perceptions of junior doctors and undergraduate medical students as anatomy teachers: Investigating distance along the near-peer teaching spectrum. Anatomical Sciences Education. 7: 242-247. Hall, S., Lewis, M., Border, S., Powell, M. (2013) Near Peer teaching in clinical neuroanatomy (2013) The Clinical Teacher 10 (4) 230-235. Border, S., Hall. S (2013) Near-peer teaching in neuroanatomy: the Southampton story. Proceedings of the Anatomical Society of Great Britain and Ireland, Journal of Anatomy 223, 83-103. Stephens, J., Andrade, M.G., Hall, S., Powell, M., Davids, J., Border, S. (2013). Investigating the impact of distance along the near-peer teaching spectrum. Proceedings of the Anatomical Society of Great Britain and Ireland, Journal of Anatomy 222, 273-304.